Legal Improv was built by the group THEY improv to help them approach the law firms, a lot of which have already been clients, with a variety of programs to improve their skill-set in ways that the firms might not initially imagine. 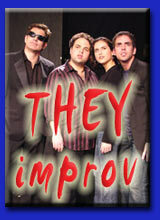 The story about the creation and expansion of THEY improv is often requested by our clients. After all, it's not about the performers of the group, it's about our clients and what THEY need! This goes for the legal clients as well as others. This website represents that expansion into other fields and serves as an entry point for law firms looking to enhance their skills. In addition to their main site and this one, THEY improv now has Faith-Based Improv, Destination Team Building, Safety Training, Gala Murders and many other initiatives indicating a bright future yet to come.